Marine Coatings Market size will surpass USD 15 billion by 2024, at approximately 7% CAGR from 2016 to 2024. Growing need for low fuel consumption will enhance the demand for regular coating by anti-fouling agents, propelling the overall marine coatings market. Fuel consumption accounts for almost half of the overall operating costs of the ship, and presence of fouling growth on the vessel body due to settling of various marine organisms, overall fuel consumption and carbon dioxide emission may increase by up to 40%. Moreover, stringent regulatory norms impel the usage the usage of high cost and environment friendly marine coatings. Volatile prices of raw materials such as oil derivatives, titanium dioxide, and copper may hinder the global marine coatings market growth in the coming years. Price inconsistency is mainly caused by demand and supply gap of raw materials in various end use sectors. For instance, crude oil derivatives find application in numerous fields such as transportation, industries, engineering works, etc. Copper, an important raw material for anti-fouling coatings, finds major application in electrical and electronics industries. Marine coatings market has been segmented into anti-fouling, foul release, anti-corrosion, and other coatings. Anti-fouling coatings are extensively used during repairing and overhauling activities as well as in new ship building to prevent growth or attachment of marine organisms on the outer layer of the hull of the vessel. These organisms hamper the overall performance and durability of the vessels by degrading and weakening the metal body. 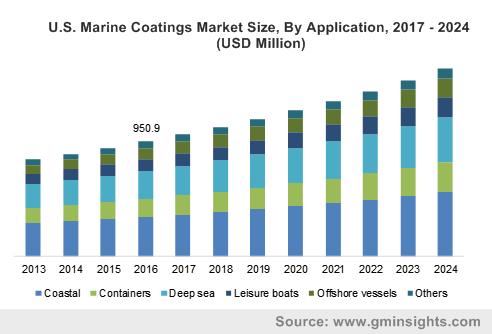 This segment accounted for over 40% share of the overall marine coatings market in 2015 and will have a have a high growth rate owing to the large number of ships that will require maintenance in the coming years. Anti-corrosion coatings recorded over USD 3 billion for the overall marine coatings market in 2015 and will likely flourish at more than 6% CAGR in the forecast span. Regular contact with saline water tends to corrode the lower body of the vessel and regular application of anti-corrosion coatings to prevent the rusting enhances the life and performance of the vessels. This feature will boost the anti-corrosion marine coatings market demand. Marine coatings market has been segmented into coastal, deep sea, containers, offshore vessels, leisure boats, and others on the basis of application. Coastal application includes dredgers, fishing vessels, tugs, passenger/cargo ferries, offshore supply vessels, defense ships, and coasters. This segment generated more than USD 3 billion in 2015, and it will grow at a healthy rate in the next eight years. Asia Pacific, led by China, South Korea, and Japan, has made tremendous advancements in shipbuilding industries. China has emerged as the global leader with new orders accounting for more than 33% of the global shipbuilding industry. Asia Pacific will have a significant share of the overall industry owing to large scale shipbuilding activities in China, Japan, South Korea, Philippines, and Taiwan. China leads the shipbuilding industry with more than 20 million gross tons in 2015, followed by South Korea, Japan, and Philippines. Global logistics market is also concentrated in this region, resulting in a high cargo ship manufacturing and maintenance demand. These will have a positive influence on the APAC market, which accounted for close to two-third of the global share in 2015. North America and Europe marine coatings market will be characterized by the high demand for naval ships along with personal leisure boats and yachts. The two regions had a combined market share of over 25% in 2015 but may lose shares to Asia Pacific, owing to the fast-developing shipbuilding industry in the region. The global marine coatings market is highly consolidated with the top four market players, which includes AkzoNobel, PPG, Jotun, and Hempel, accounting to over half of the global share. Other important manufacturers include Nippon Paint, Kansai Paint, DuPont, BASF, Sherwin-Williams, KCC Corp., RPM International, and Chugoku. Marine coatings market has witnessed a good recovery after the global economic downturn. In spite of new ship production not reaching the past level, repair and overhaul operations of the vessels has a high product demand. This trend will likely continue throughout the forecast span. The mandatory usage of the product for increasing the factor of safety as well as the aesthetic features will enhance the overall product market in the coming years. Asia Pacific, with large scale production and repairing and overhauling activities of ships and vessels, will likely hold sway the market throughout the forecast span. The presence of large scale manufacturers signifies the marine coatings market with a notable amount of forward and backward integration across the industry ecosystem.